A feasibility study is active capital campaigning and is an integral part of the cultivation and involvement process of major donors and prospects. A feasibility study tests your organization’s campaign goals with top donors as well as organizational and community leadership. Through high-level, confidential discussions, JGA discovers objective and subjective factors that may affect a donor’s desire to give — or withhold — support. By giving donors an early opportunity to listen, become involved, indicate their possible level of support, and voice their interests and their hopes for your campaign, your organization can more effectively and successfully address the vital personal and tactical aspects of donor relationship building and cultivation. 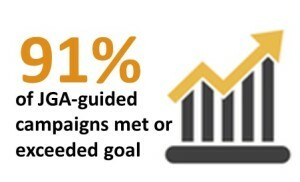 As part of a feasibility study, JGA also works with your organization’s leadership to recommend a campaign goal, design a campaign structure, develop a timetable and sequence of action, and establish an overall strategy for cultivating and soliciting the lead gifts to kick off your campaign. Clients believe JGA goes “deeper” than other philanthropic consultants by providing thoughtful qualitative analysis and recommendations, notably through our feasibility studies. JGA does not shy away from giving difficult news when the client needs to hear it, notably when it comes to the high stakes involved in major campaigns. Consulting integrity takes precedence. We are authentic partners in our clients’ journeys.